Those familiar with the specialty food company, Harry & David, may not realize this firm has its headquarters in Medford. Just like, members of the RV organization Good Sam may be unaware nearby Central Point is Dogs for the Deaf’s home. We spent an afternoon at Dogs for the Deaf learning about this organization’s history, purpose, and methods of training. After meeting with Kimberly Miller, whose position is Donor Support Coordinator, we watched a 20-minute video about DFD. 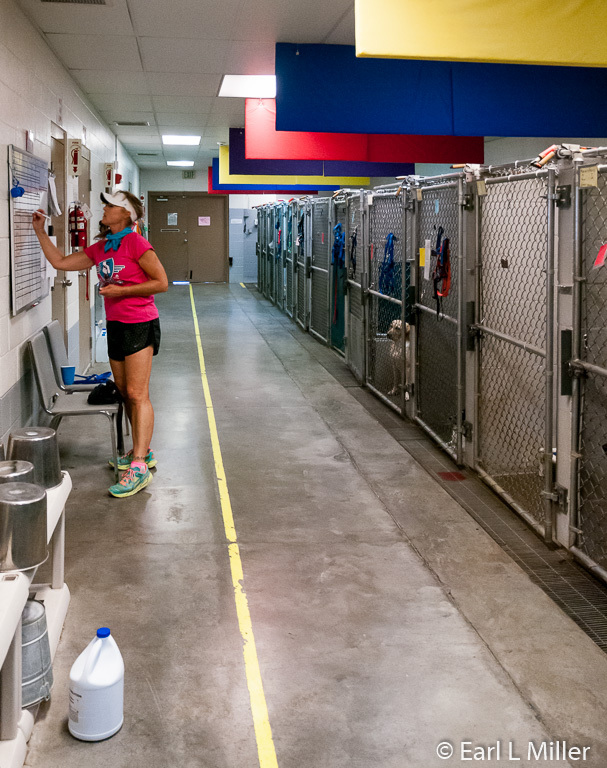 After viewing a demonstration session by Bonsai, Kimberly’s foster dog, we toured the facility including the main kennel building, where we noticed other dogs. 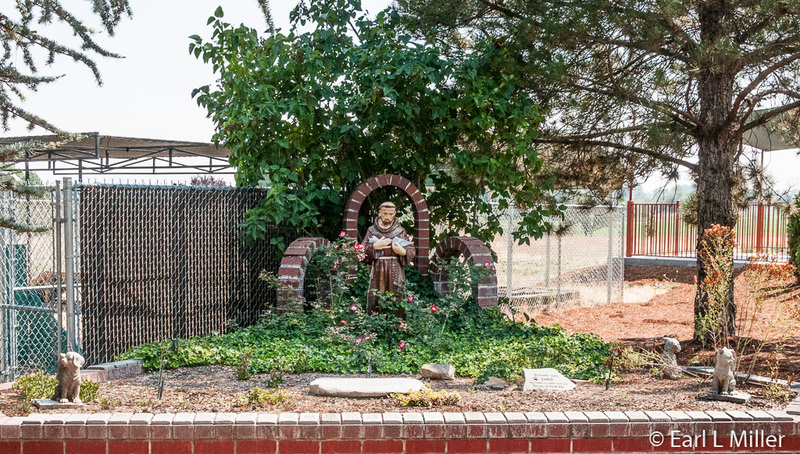 Between the kennel quarantine building and main kennel, we viewed the Memorial Garden honoring the DFD dogs that have passed-away. 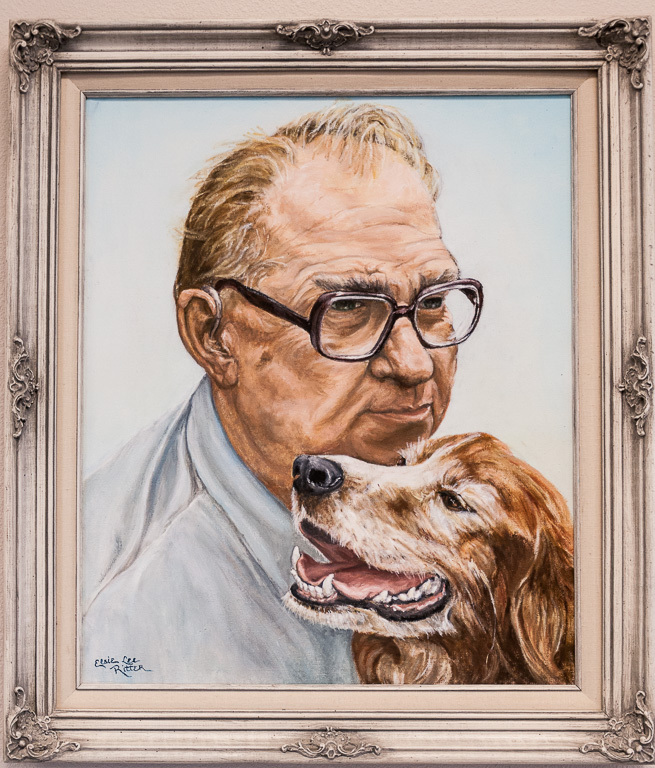 In 1977, Roy G. Kabat founded Dogs for the Deaf. Since that time, the organization has rescued and placed more than 3,000 dogs in homes as Hearing, Program Assistance, and Career Change dogs also known as the adoptable/companion dog program. It has been a win win situation for the animals and for the people with whom they were matched. In 1976, the American Humane Association in Denver approached him. They were trying to train a Hearing Dog and asked for his assistance. He went to Denver from Jacksonville, Oregon to work with them. When he finished, he returned home and set in motion Dogs for the Deaf. The first property, in 1977, was in Jacksonville with the headquarters later moving to Central Point. His first official demonstration dog was Jeremiah, whom he had rescued from a shelter. Kabat trained Jeremiah to respond to alert to sounds such as a smoke alarm, door knock, a telephone ring, an alarm clock, an oven timer, baby’s cry, and a “name-alert” sound. 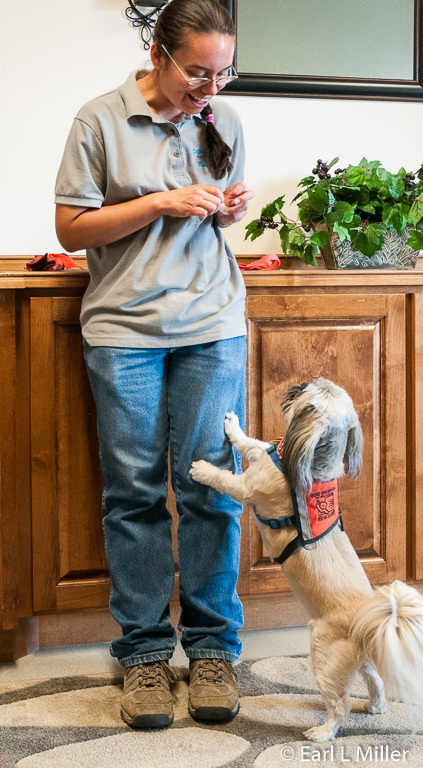 He traveled to many parts of the United States showcasing his skills as a hearing dog while Kabat educated people about DFD’s services and the benefits of Hearing Dogs. Kabat worked at Dogs for the Deaf for three years then turned it over to his daughter, Robin Dickson. She ran it until retiring in 2013. Blake Matray, a retired Lieutenant Colonel with the U.S. Air Force, took over the position. After the military, he had an extensive history where he worked with an autism non profit organization. DFD rescues dogs, which may otherwise be euthanized. These come from animal shelters, primarily located in Oregon, Washington, Idaho, and California. The dogs are mostly mixed breeds with ages ranging from ten months to three years of age. Personality is vital with staff seeking dogs that are friendly, outgoing and confident. It’s a win win situation for the dogs and the people they help. The dogs help people gain more independence and lead safer lives in return for receiving love and companionship. The dogs are placed in one of three programs. Hearing dogs alert people to all the household sounds that Jeremiah knew. They may also go to work making their person aware of sounds in the work environment and public. Little dogs are trained to jump up and tap people on the leg while big dogs give a nose tap so they don't cause a person to lose their balance. Then all walk to the sound source so that the deaf person understands what the dog is alerting him to. Program Assistance Dogs go to work with and assist professionals such as doctors, teachers, and licensed therapists or counselors. These dogs are trained to be calm and relaxed regardless of what is going on around them. They will go to clients or students on command to help ease anxiety and as a reward for positive behavior. Not all dogs succeed in either of these positions. The success rate is about one in four. Yet, DEF never returns unsuccessful dogs to the shelters. Instead, the organization seeks forever homes where they become loving pets and companions. These are called Career Change dogs or adoptable dogs. Normally DFD has 20 to 28 dogs in training at their facility at any particular time. They currently provide 35 dogs a year for their program with the goal to train 40. A dog, on average, works between twelve to twenty years. DFD lets the dog decide when it is ready to retire. When it does, it can stay with the recipient, go to live with a friend or relative, or return to DFD to be readopted as a Career Change dog. The same applies if the client dies, develops health complications, or becomes unable to care for the dog. “We make a lifetime commitment to the dog,” said Kimberly. When the dogs are rescued, DFD gets the animal to optimal health before beginning training. They go into quarantine for two weeks, on average, where they’re spayed or neutered, micro- chipped, and taken to a veterinarian for shots and a full medical checkup. After they’re cleared of any health issue, they’re reassigned to the kennel where training begins. The newcomers are introduced to the other dogs, one at a time, and later can become part of play groups. DFD takes complete care of these dogs until they are sent to their new homes when the pet owner takes over their care. If a severe health problem develops, DFD tries to assist with health care expenses. Cats are used in training programs. Dogs are taught they must focus on their job regardless of what the cat is doing. They can go to a home with a cat because they’ve been socialized to accept cats. However, assistant dogs can’t be placed in homes with dogs because “Untrained dogs can untrain trained dogs,” Kimberly told us. Training for obedience, socialization, and specialized training takes four to six months on average. Positive reinforcement is used. The method varies from dog treats to clickers to lots of praise and hugs. Each dog has their own personality and learning style. In the demonstration we watched, demo dog Bonsai jumped and tapped the trainer on the leg when he heard the oven timer and in response to a door knock. Because of the jumping, DFD stays away from dogs with long backs, like Dachshunds. Outside the kennel, we saw an agility course which provides exercise for the animals. Staff also takes them on a paved dog walk path which is about a half mile long. Its construction and installation were provided for by the Oregon Good Sam Club and the Powell Foundation. 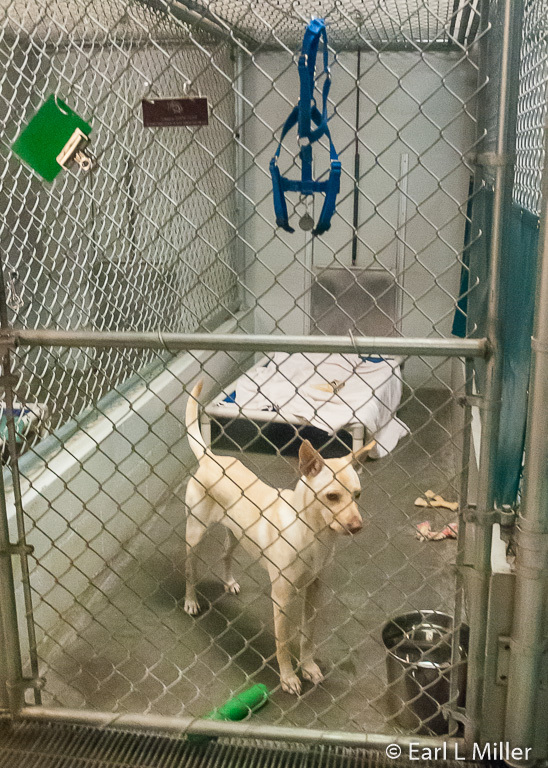 In the kennel, almost all dogs have their own individual kennel, dog run and cot. Those who are hearing impaired and seeking a dog must apply to DFD by filling out an application form, providing an audiogram, and sending DFD a fee of $50. Upon approval, a $500 Good Faith deposit is required. That deposit is returned after the person and Hearing dog have been together for a year. Only severely hearing impaired or deaf persons obtain dogs. Usually, the applicant must be at least 18 years of age. Each applicant then has to go through a thorough screening process. Once they are selected, they’re matched with the appropriate dog based on lifestyle, environment, exact needs, and the dog’s preferences. Kimberly told us that 98% of the matching goes smoothly. To make the right match, DFD’s goal is to understand the needs of their clients and their dogs. Some dogs prefer a one person household, don’t like canes, or dislike cats or children. Clients also have particular needs that must be taken into account. Waiting time for placement is anywhere from a few months to approximately a year. That is because previous clients go to the top of the list for a new dog and because the right matching is so essential. DFD is hoping to expand their facility so this time decreases. When training is completed, a certified trainer travels with the dog to the new client’s home for a week of hands on training and transition. The owners must provide quarterly progress reports for the first year and then annually afterwards. As part of the program, DFD provides lifetime help and support to the assistance dog team including follow-up visits to ensure each team’s success. To obtain a Program Assistance Dog, it is necessary to apply and send in a $50 fee. Again, the $500 Good Faith deposit is required for those approved. Applicants must be adults who work with people who have physical, mental, or emotional challenges. It costs Dogs for the Deaf $25,000 to train a dog. As a 501 non profit agency, DFD depends solely on donations. It receives no government funds. You will find Dogs for the Deaf at 10175 Wheeler Road, Central Point. They can be reached at (800) 990-3647 to schedule a free tour, volunteer, or request an application. Visit many of the outlet malls around the country and you’ll find the retailer Harry & David. The company is well known for its gift baskets filled with gourmet foods, mostly notably its Royal Riviera Pears, Moose Munch Gourmet popcorn snacks, and Tower of Treat Gifts. It also sells flowers and plants, fresh fruit, chocolates, sweets, and wine. Purchases are via their nationwide stores, mail order, and web site. 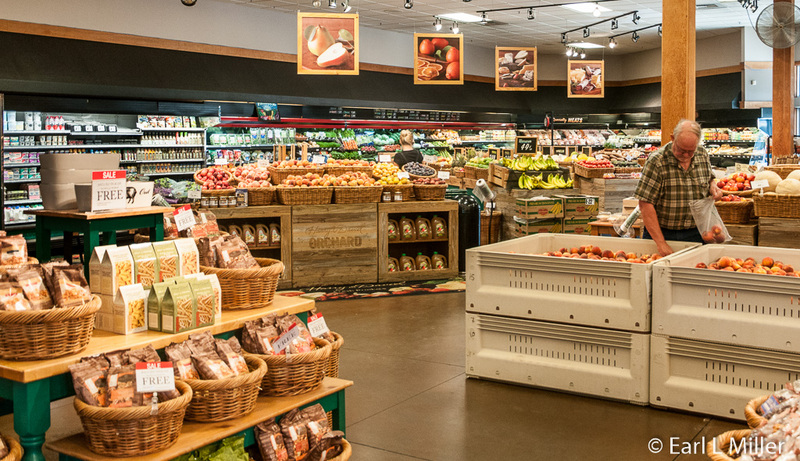 Harry & David first started operations in 1910 as Bear Creek Orchards That year, Samuel Rosenberg, a hotelier, purchased 240 acres of prime pear orchards in Southern Oregon. The orchards dated to 1885 and received their name because of Bear Creek running through its property. Rosenberg’s sons, Harry Holmes and David Holmes Sr, took over the company in 1914. They decided to specialize in Comice pears. In the 1920's, they built a packing house and a cooling plant so their pears could be prepared for long distance shipment. The brothers named the pears, the Royal Riviera Pears, and sold them in Europe to hotels and restaurants. Throughout the Roaring Twenties, their business boomed. Following the Great Depression, their business started to diminish. In 1934, they devised the idea of selling their pears via mail order. They made sales trips to San Francisco and New York, visiting the captains of industry, and pitching their pears as the ideal business gift. Soon orders rolled in. The company introduced its “Box of the Month” plan in 1937. It was later called the “Rare Fruit Club” and eventually the “Fruit of the Month Club.” Customers still enroll in this club. They can choose 3, 6, 9, or 12 month options. Other clubs for desserts, wine and cheese, and Moose Munch are available. 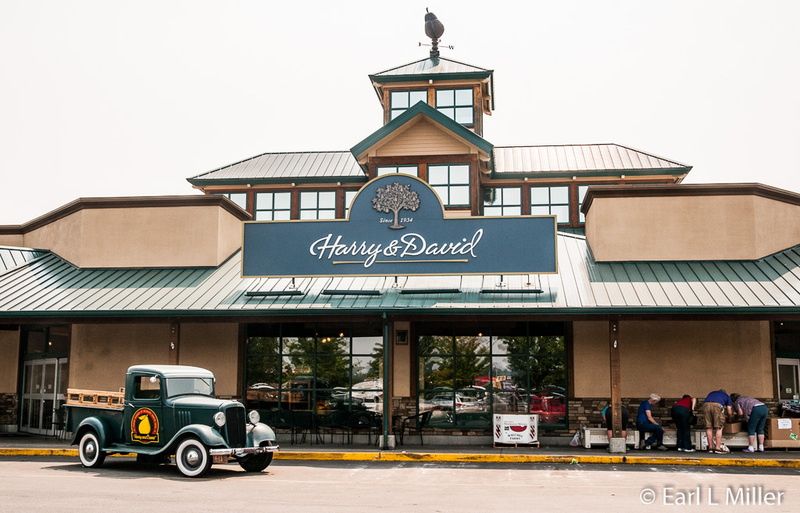 In 1934, Harry & David became incorporated, replacing the name Bear Creek Orchards. In 1972, David H. Homes, Jr. created Bear Creek Corporation as Harry & David’s parent company. It became public in 1976, remaining so, until RJR Nabisco purchased it in 1984. Harry & David has since been through a number of owners such as Shaklee, a Japanese pharmaceutical company, and then in 2004, two United States investment firms. In 2008, the company acquired Wolferman’s, specializing in English muffins and other breakfast foods, and Cushman’s, a Florida company known for selling Honeybells, a tangerine-grapefruit hybrid. It established a winery in 2012 that used Oregon grapes. In September 2014, it was sold to 1-800-Flowers.com. During the 1990's, Harry & David expanded its retail operations, opening more than 119 stores. Today, they have 46 stores in 25 states. They also open temporary ones for the holiday season. For example, in the Phoenix metropolitan area they have opened three temporary stores this season. In addition, sales also go to Canada, Germany, and the United Kingdom. 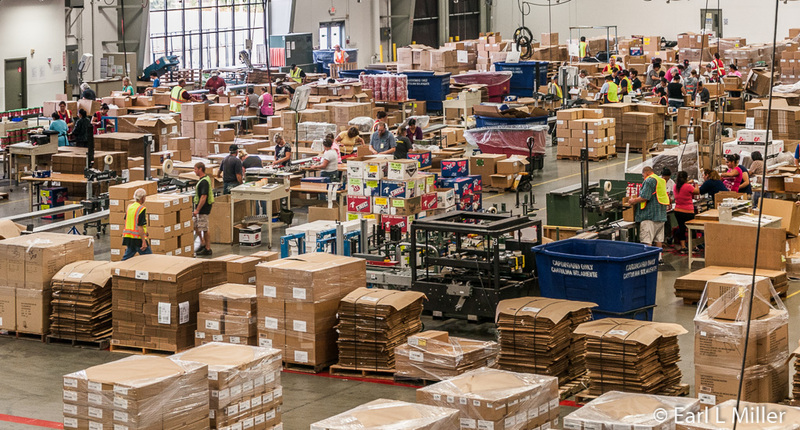 Operating 2,000 acres of orchards, manufacturing facilities, a call center, and a distribution center, they are the Medford area’s largest employer. 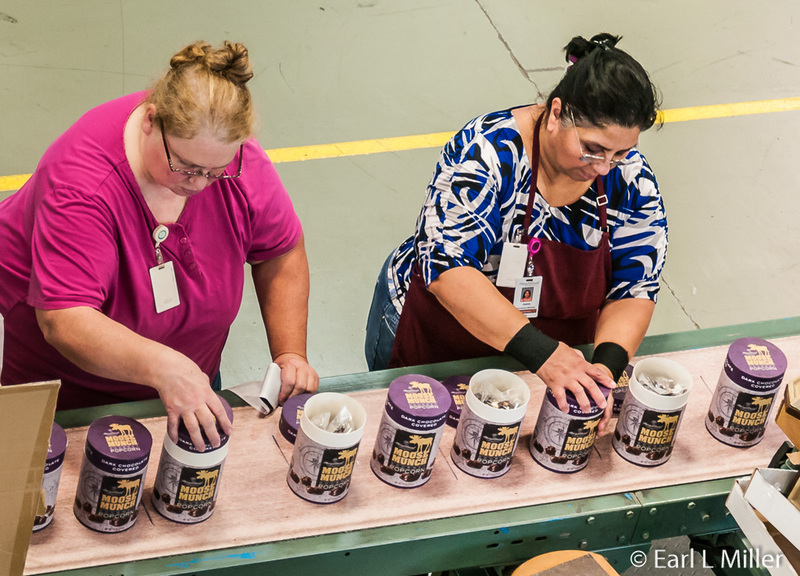 They also have distribution centers in Eugene, Oregon and Hebron, Ohio. Eighty percent of the orders come in via the Internet. You can check them out on line at http://www.harryanddavid.com. Harry & David has 1400 full time employees. 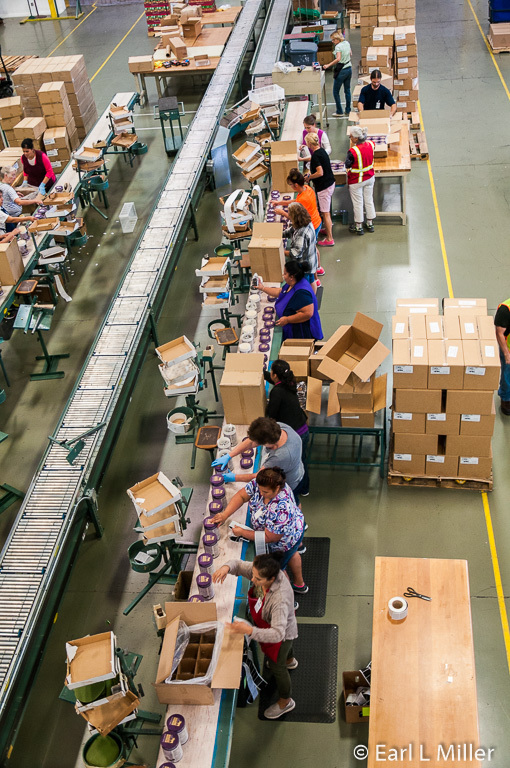 Seventy five percent of the seasonal employees return every year with the increase starting in July. By Christmas, the staff reaches around 9,000. You can spend a whole afternoon touring the Harry & David Plant. 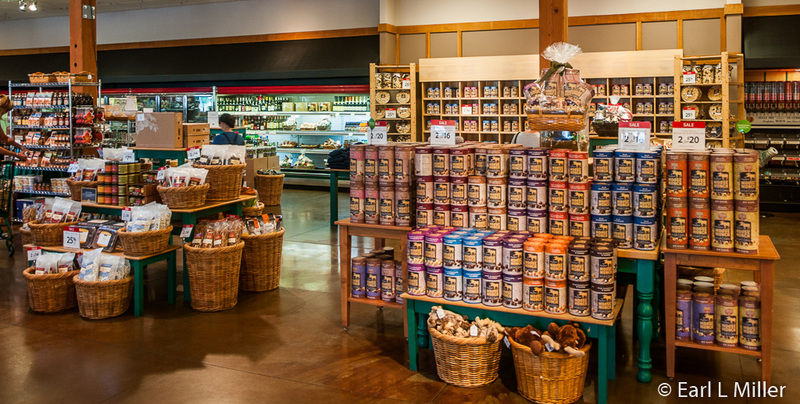 It encompasses the packing plant, driving past the orchards, and spending an hour at the bakery and candy kitchen. At the tour’s end, all receive a small box with factory treats. Since you’ll be walking quite a distance, good walking shoes are a necessity. The tours run every day, Monday through Friday, at 9:15 a.m., 10:30 a.m., 12:30 p.m., and 1:45 p.m. They leave and end from the Harry & David Country Village Store where you board the company’s buses. The charge is $5. In return, you’ll receive a coupon for $5 off any purchase of $40 or more at the store, on the day of the tour. The address is 1314 Center Drive in Medford. Reservations are essential. To arrange them, call (877) 322-8000. We were impressed with the Harry & David store’s immense size and variety. I’m convinced that it carries every product the company makes. The huge areas for wines and produce had great prices. For example, peaches sold on sale in August for twenty cents a pound. The company also carries cheeses and meats as does their catalog. Numerous products were 20 percent off. These could be combined with an AAA discount of 15 percent off. The Medford Convention and Visitors Bureau, next door, provides other coupons offering ten dollars off. At our first stop, the packing building, we learned their pear trees have an average of 70 pears. It takes thirty days to pick the pears off of the trees, Then the fruit goes to cold storage. After remaining up to five months in cold storage, they’re shipped. Customers have five days to use them at home. 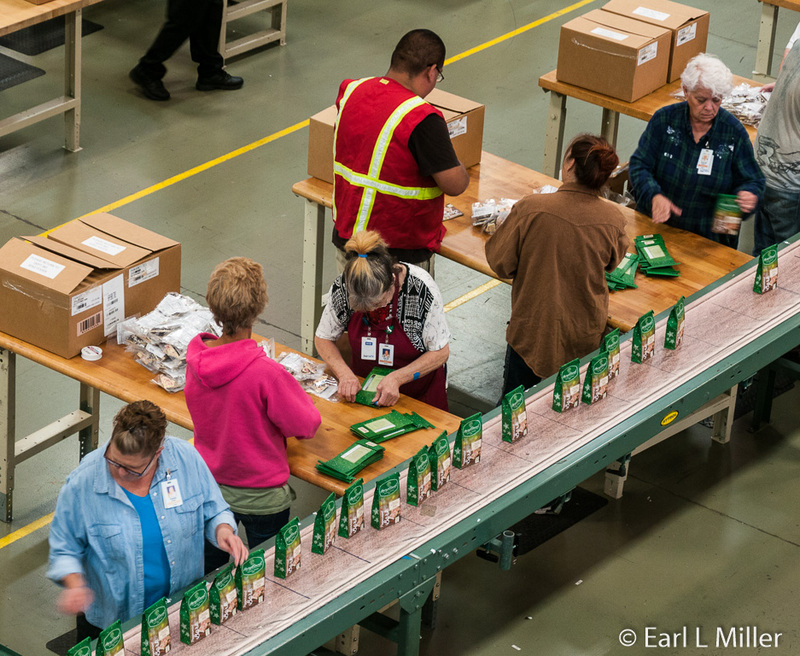 Harry & David hand packs 17,000 tons of pears annually. 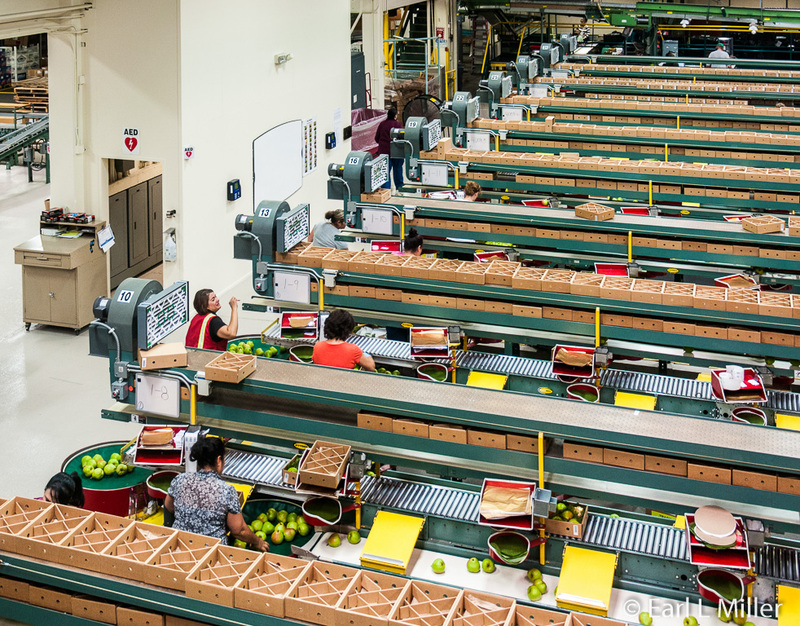 We saw assembly lines of fruit. Harry & David doesn’t grow all their fruit but acquisitions some from other growers. For example, their apples come from Wenatchee, Washington. They also don’t grow their cherries or tropical citrus. 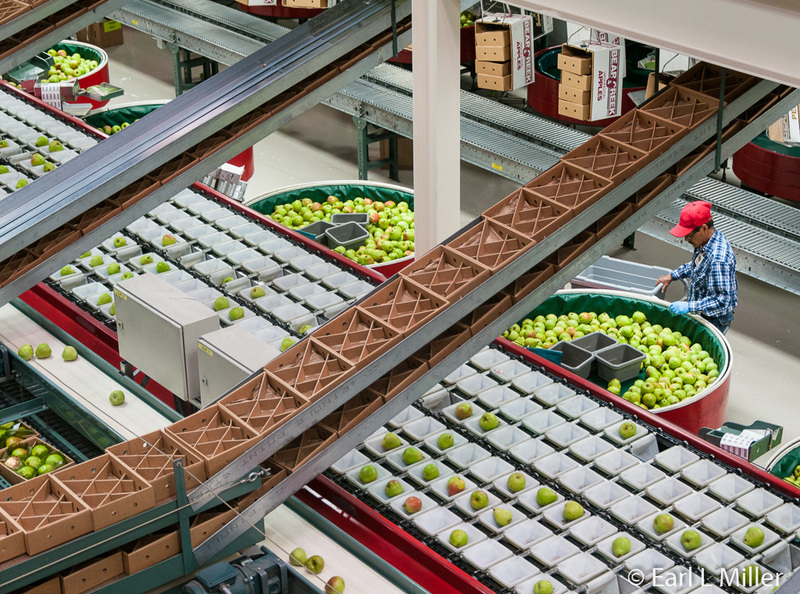 We watched the six lines of conveyors where fruit was weighed and placed into boxes. Packers put between two to sixteen pears in a box. At the end of the room, these gift boxes of different sizes were inspected. One conveyor rejected unsuitable fruit. In this building, we spotted a number of forklifts and were told they have 200 of them. Each time something is moved information, such as the date, time, product, and driver, is scanned. That allows company management to be aware of their inventory’s location. We also observed boxes being made. Packers, according to our guide, have 15 seconds to manually make a box. Harry & David produces five million gift boxes a year with four million of these containing apples and/or pears. Afterwards, the bus driver drove from this building past the pear orchard to the bakery and candy kitchen. Here they produce various cakes and candies. When we were there, they were making chocolate-covered graham crackers and chocolate-covered Moose Munch. We first had the tour on the second floor. To go upstairs, you can use the elevator or stairs. 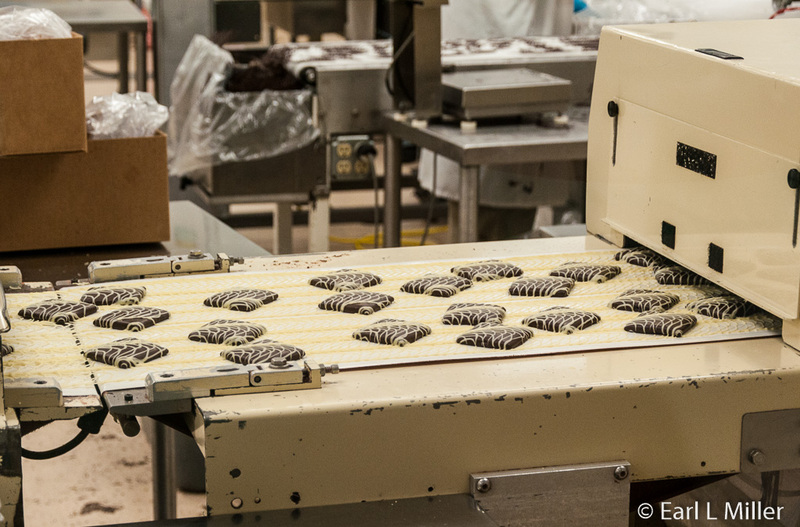 Milk, white, or dark chocolate-covered candies, as well as peppermint bark, are produced here. Enrobers coat graham crackers, pretzels, cherries and dried fruit, as well as cookies. 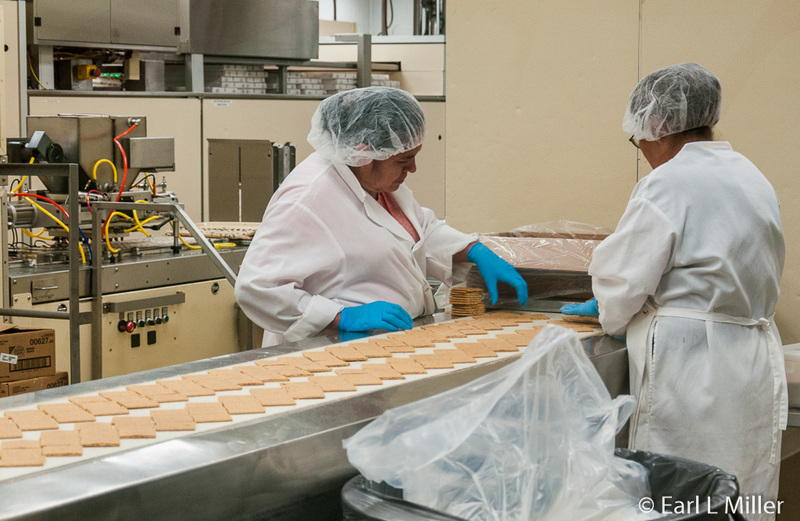 For their orange cookies, they cover the cookies in white chocolate then use food coloring to make them orange. 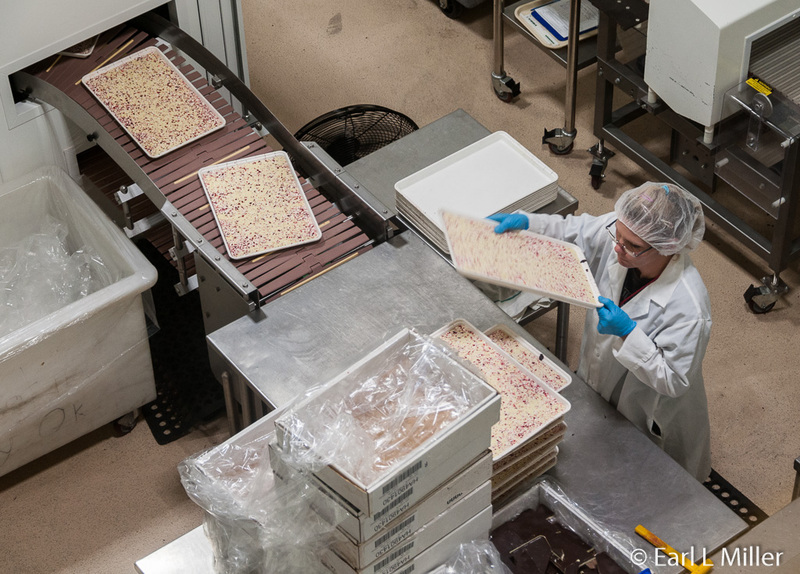 The candy is put on trays, weighed, made, and moved to wrapping. Three hundred pieces are wrapped in a minute. Truffles are covered with double chocolate with a decorative trim. 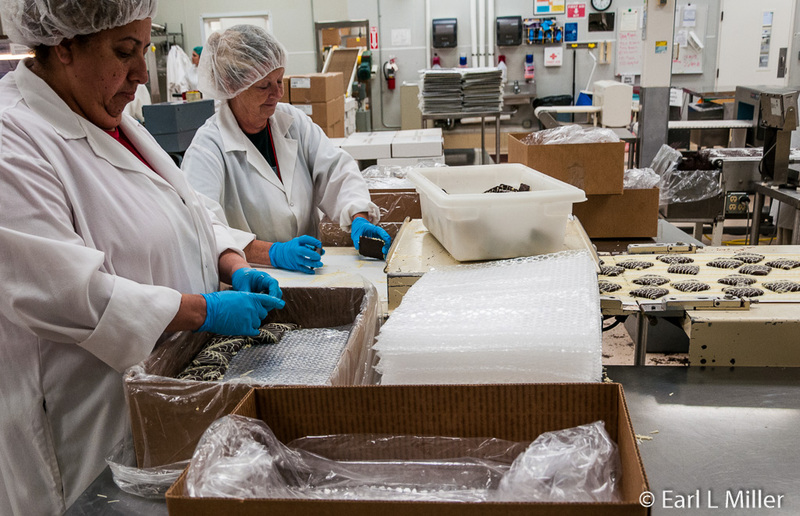 We viewed a line of coffee shop truffles being sorted and packed. These combine chocolate with flavors like hazelnut macchiato or double cappuccino. Their signature truffles come in an array of flavors including milk chocolate and dark chocolate cherries. We observed the preparation of Moose Munch, their gourmet popcorn. It comes in 35 different flavors. We saw the caramel base in the kettle ready to receive the popcorn. It’s called slurry and is composed of water, syrup, and butter. 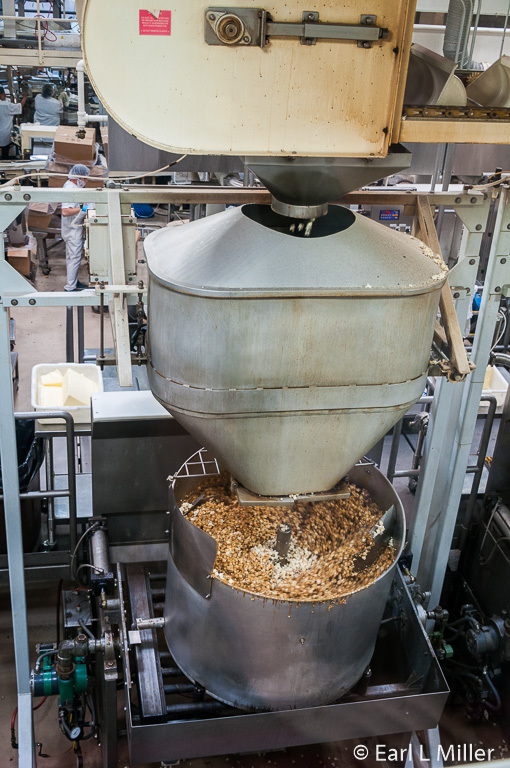 Twenty-three pounds of popcorn are poured into the kettle then the mixture turns together. Soy lecithin is added as an emulsifier. Then it’s sent to the conveyor belt. Popcorn is poured into a second kettle after a ten minute delay. 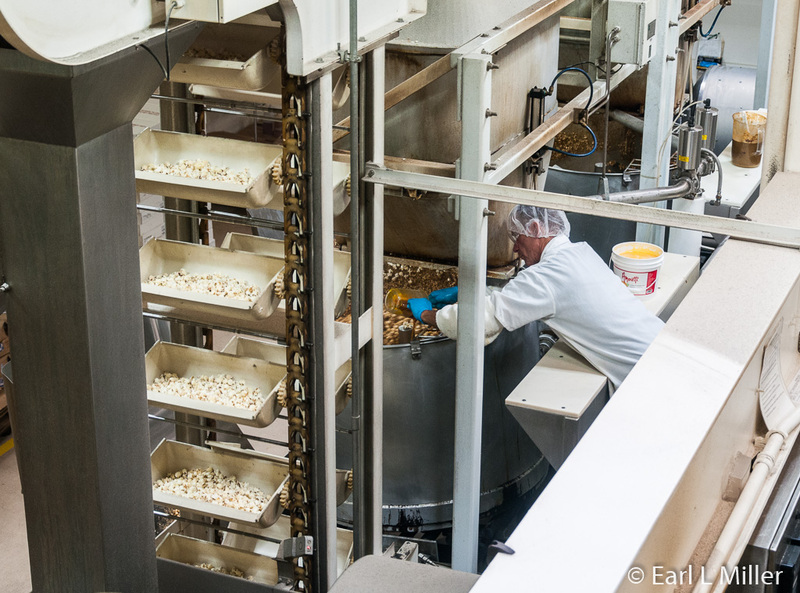 Harry & David make one hundred pounds of popcorn each hour. At the store, we saw Moose Munch in large plastic trays as well as cardboard cylinders in different sizes. The factory recycles 90% of their waste products and hope their customers recycle the containers. Our guide advised us that all cardboard comes from Boise Cascade. We watch cranberry loaf cakes being packaged. They go to blast freezers after labeling. The company makes other cakes as well. These include apple spice, pumpkin, pineapple macadamia nuts, and chocolate cakes. Besides creating its own cheesecakes, it is the exclusive distributor online for Cheesecake Factory cheesecakes. Harry & David ships all cakes frozen. Downstairs, we viewed the flavoring tanks for the truffles and graham crackers. We also spotted the tempering tanks for the chocolate which is kept at a temperature of 110 degrees. We then boarded the buses to return to the Country Village Store. On our way back, we passed the headquarters as well as the headquarters building constructed in 1934.